A brief look at the new Control of Noise at Work Regulations (2005), the changes in acceptable noise levels in the workplace and how to measure and calculate new noise level requirements. The New ‘Control of Noise at Work’ Regulations 2005 came into force in April 2006 and at the same time, the Noise at Work Regulations 1989 will be repealed. Bringing with it 5 dB reductions is allowable levels, more levels to monitor, Limit values, compulsory health surveillance, weekly averaging and tighter hearing protection controls, this piece of law has more to it than might appear on the surface. The legislation text can be downloaded from the HSE web site and a guidance book is available from HSE books, which is a must for anyone with potential noise risks. This article looks at the main changes from the original regulations as well as some of the issues employers are going to face as a result. The EU Physical Agents Directive travelled a long and tortuous path, starting in 1993 as a proposal to deal with a multitude of ‘agents’, which were noise, vibration, optical radiation and non-optical electromagnetic fields. This idea was short lived due to clear problems with trying to put all that information into one document. In 1999, sense prevailed and the vibration element was split out into a separate directive. In 2001, a proposal for the Noise part was put forward. The other bits are lagging behind somewhat although there is movement on the optical radiation directive! Eventually, through committee after committee and draft after draft, we are given the Physical Agents (Noise) and the Physical Agents (Vibration) Directives, with which the member states must lay down legislation within a given time. The Vibration directive became law in June 2005 whilst the Noise Regulations will be with us in April 2006. It is the latter that will be dealt with in this article, which looks at some of the main changes and what they mean. It is by no means comprehensive and is no substitute for reading the regulations and guidance in full or attending a competence training course. Following wide industry consultation, the regulations are now ready for introduction in April 2006. The following points detail the main changes from the original Noise at Work Regulations 1989, which is to be repealed. The main thrust of this new law is to lower the acceptable levels of noise exposure, above which both employers and employees are required to take certain actions (see figure 3). This is based on medical evidence suggesting that people may actually be prone to damage from continuous nose exposure at levels as low as 70dBA. Although the levels in the new regulations have not been set that low, the proportion of people at risk is dramatically reduced compared with the 1989 law. The first point to note is that there are 6 levels to monitor in the new regulations, compared with 3 in the 1989 version. It is also clear that the action levels have been reduced by 5dB each. DeciBels are logarithmic and don’t work like normal numbers so this 5dB reduction actually equates in real terms to a 68% lowering of the levels! This means that a process that only just meets the existing criteria, will have to be reduced in sound energy output terms by 68% to maintain compliance. New to the world of noise at work assessments is the concept of an Exposure Limit Value, set at 87dB(A) Lep’d. This is in place such that no employee shall be exposed to this level or above under any circumstances! On the face of it, this seems a tough one to deal with, except that hearing protection can be taken into account (as described below) unlike the action values. What this does mean is that care should be taken in the assessment of which hearing protection to use and it might be wise not to use the SNR method (explained later) for that reason. If workers are exposed to high levels of noise for only a small part of a week then, under the new regulations it is possible to average the exposure they receive over the whole week, thus reducing the Lep’d. Care should be used when applying this derogation that the exposure is truly over a short enough duration and that it is not used simply as a means of circumnavigating noise control measures. It has always been the case that the use of hearing protection should be a last resort after noise control measures have been taken as far as reasonably practicable. Even so, many employers still provide them and need to be able to produce evidence that the correct protection has been selected for each application or task. The original and the new regulations both give 3 methods for evaluating hearing protection in the workplace. These are Single Number Rating (SNR), High Medium Low (HML) method and Octave Band selection. All the methods of assessing the effectiveness of hearing protection are based on using data supplied by the manufacturer of the defenders. The Single Number Rating is an estimate of the average, overall protection offered by a particular plug or muff etc. The problem is that ear defenders work considerably better at stopping high frequency sound than they do with low frequencies, so if the noise in question is predominantly low frequency, then it is easy to under estimate the amount of protection and over expose the employee. Great care should be exercised when using the SNR method. The HML assessment method uses a measurement of both the ‘A’ and ‘C’ weighted sound levels to give some indication of the amount of low frequency noise present. Using a simple formula and table, which is described in the guidance notes, a slightly more accurate prediction can be made. A sound meter must be able to measure an ‘A’ weighted and ‘C’ weighted level as an Leq, so that the SNR or HML methods can be used. The best method of all is to measure the Octave Band frequency levels and use the table provided by the manufacturer (the one on the packet that had little meaning until now!). 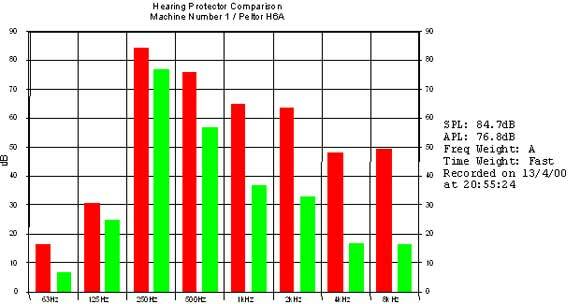 The octave band measurement gives a fairly detailed breakdown of the level of noise protection at various frequencies, so when the manufacturers’ data is applied, a much better picture will emerge of the effectiveness of the hearing protection device. Figure 2 shows a measured octave band in red and protected levels at the ear in green. The table in figure 2 shows the overall SPL (the level outside the ear, without protection) and the APL (the level inside the protector, at the ear). Some real-time octave band sound meters can calculate all this on-screen by using a built-in database of hearing protection data. The new regulations do make a change to this process, based on concerns by many that the ‘real-world’ performance of ear defenders is rarely as tested by the manufacturer. For the SNR and HML methods of performance calculation, the regulations state that the effectiveness of the defender should be de-rated by 4dB. For SNR numbers, this means subtracting 4 from the value given on the data-sheet and for HML numbers, it means decreasing the predicted noise reduction (PNR) level by 4dB. For Octave band assessments, the HSE guidance states that assumed protection should be de-rated by adding 4dB to the overall measured levels. The original directive text states that this de-rating can be achieved by subtracting a further standard deviation from the mean performance data, this is likely to be the adopted process in the rest of Europe; these values can be found on the data-sheet from the manufacturer. It clearly states in the new document that the focus should be on risk assessment and that measuring the actual sound levels may not be necessary. A number of ‘listening checks’ are given to allow employers to assess whether or not they might be above the Lower Action Value. The principle is that as long as employers are carrying out risk assessments and hearing conservation there will be a much reduced effect on the population from noise induced hearing loss. The justification for this approach is largely to abdicate smaller companies from the responsibility of having to carry out measurements themselves. There is a problem, however, with not taking measurements and it is one that is recognised by many industry specialists. The problem occurs in producing evidence in defence of future civil claims. Without measurements, there is in practice, no defence leading to successful claims and huge potential costs. The reason this is not written into the regulations is that the HSE do not have a remit covering civil matters. In essence, to satisfy the HSE, a company may well not need to measure noise levels at all, but not doing so, could lead to a long-term nightmare of indefensible claims and spiralling costs. Many insurance companies are taking this issue on board. Conducting health surveillance to establish the effects of noise exposure can only really mean audiometric testing (hearing tests) and the reason this was not included in the 1989 regulations is that, in theory, these tests are freely available on the NHS. In practice, of course, this is not the case and certainly does not provide a satisfactory system for use in industry. The new regulations make health surveillance mandatory at the Upper Action Value (UAV), although at the Lower Action Value (LAV) the requirement is only to offer audiometry to people who are more sensitive and therefore prone to NIHL. The original Directive states that employees exposed to the UAV or above have the right to a hearing check conducted by or under the responsibility of a doctor, meaning an Occupational Physician. The regulations, however say that it will be acceptable for the test to be conducted and interpreted by a suitably qualified person although referral to a doctor should be made if necessary. The reason for this change, and quite rightly so, is down to the availability of occupational health professionals in industry. Having looked at what the regulations have in store, it is a good idea to mention some of the fundamental bits that people often find it hard to grasp. For the more advanced, please feel free to skip this section. The term Leq simply stands for Level equivalent. This means that if you look at a varying sound level over time, it is very difficult to take anything meaningful from it as the dB level is constantly changing. A Leq gives a single number that is equivalent to the varying source. In other words you get the same amount of energy from the varying sound as you would from the continuous sound. This is a very important concept as it means all the variations can now be represented by one number. Leq is arguably the most important Noise at Work Parameter you can measure! The main actions required by the law (both original and new) are based on assessing a daily sound exposure figure (written as Lex or Lep’d). This is an often misunderstood, yet fundamental point, which if not observed, will invalidate any risk assessment. In fact, sound exposure is just like any other form of exposure, for example, dust, gas, radiation and even sunlight. To take Sunlight as an example: if the average strength of the sun is measured over the course of a day (call it 8 hours), this will give a figure showing how strong the sun is. This does not, however say anything about how brown (or burnt) a person might get as this in turn depends on how long they stay outside. If the sunbather spends 4 hours in the sun, then they have had half of the available sunlight so it would be logical to take half of the number measured and use that as the exposure figure. The same principle applies to sound exposure, where Leq is a measure of the level that exists at the workers ear position. This can be measured using a reasonably basic, ‘integrating’ sound meter. The Lep’d (or lex) is then the proportion of that Leq relative to the time spent exposed. There is a formula to calculate this as it is not simple arithmetic, but the principle is the same. Alternatively, a personal sound exposure meter (dosemeter) can be worn that will give the actual Lep’d (Lex) as it is accumulated. The Noise regulations, both old and new set maximum Peak pressure levels that employees should be exposed to. Many people confuse Peak (written as Pmax, Lpeak or Ppeak) with Lmax (written as Lmax! ), which is the maximum sound pressure level and is quite different. To explain; if it is accepted that sound waves are somewhat like waves on the sea where the crests rise above normal sea level and the troughs dip below. To Look at one wave crest and measure how much water is in the wave, it would have to be levelled off into a box, making it lower. There would then be 2 measurements, one for the height of the wave and one for the level of water in the wave. For a sound wave, the height of the wave is the Peak and the level of the water is the rms. 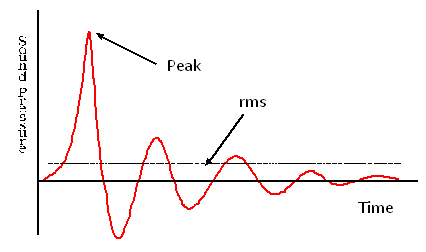 The more impulsive the noise, the bigger the difference between the Peak and the rms, so using the rms maximum (Lmax), instead of the Peak reading can give seriously erroneous readings. The changes brought by this new set of regulations are not necessarily profound (apart from the 68% level change!). There is, however al lot of detail and many small changes from the existing position, which require care in implementation. The guidance on regulations from the HSE should be read and digested and it may well be wise to attend a ‘Competent Person’ training course for Noise at Work assessments. This legislation is written from the point of view of the HSE, whose primary concern (and rightly so) is with the protection of employees who are exposed to excessive noise levels. What they are not concerned with (and they will happily confirm this, if asked) is civil litigation. In other words, as long as an employer is taking enough action in the eyes of the HSE to prevent people going deaf whilst at work, they will be happy. Fair enough! The problem is that this may well not be enough to mitigate any claims that come along in the future! Controlling Noise at Work: The Control of Noise at Work Regulations – Guidance on Regulations, HSE Books. Proposals for new Control of Noise at Work Regulations Implementing the Physical Agents (Noise) Directive (2003/10/EC). Available on the HSE web site at http://www.hse.gov.uk/.